A brute force attack is when an unauthorised person hacks into a system by attempting several password combinations until they’re able to gain access. 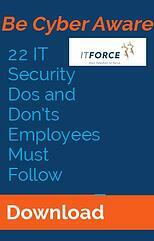 For any company whose employees use passwords to access important documents, brute-force attacks are a threat to the security of your organisation’s data. Generally speaking, brute force attacks typically involve automated systems that repeatedly guess the user name and passwords for specific applications our services. It is important to note that we (and all other Office365 customers) are under constant bombardment by hackers trying to get access to our accounts. Our 2-factor authentication helps greatly to mitigate this. 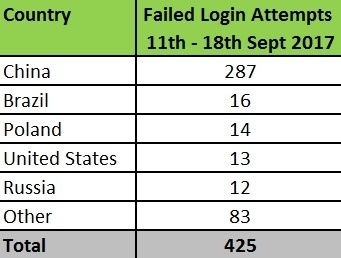 IT Force have compiled a list based on the number of failed login attempts into our Office365 broken down by country. These numbers are from one week during September. It is important for all users to be vigilant of phishing emails which try to get you to enter you 0365 credentials. Be particularly careful if you get an email asking you to enter these (after clicking a link) and if in doubt don’t do it.